(Small- 4 pieces; Large- 8 pieces) Tender pieces of chicken marinated in a rich marinade of yoghurt, cumin, chilli, ginger, garlic and grilled in tandoor. 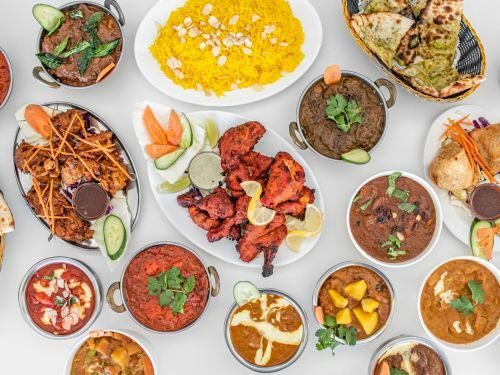 (Minimum of 2 people) 1 x Tandoori Chicken, 1 x Onion Pakoras, 1 x Aloo (potato) Vada, 1 x Veg or Meat Samosa, 1 x Large Curry per person, 1 x Saffron Rice, 1 x Naan or Garlic Naan, 1 x Yoghurt and Cucumber Raita, 1 x Pappadams and 1 x Gulab Jamoon (dessert). Boneless tandoori chicken cooked with tomatoes, ground almonds and spices in a smooth thick gravy finished with cream. Diced chicken cooked with yoghurt, almond meal and cream. Chicken tikka cooked in a ground almond curry with capiscums, onions and coriander. Diced chicken cooked with crushed pepper, onions, ginger, garlic and special house spices finished with coriander. Diced chicken flavoured fresh ginger, garlic, onion and finished with sliced mango and fresh coriander. Chicken curry cooked with ginger, garlic and spinach. Diced chicken cooked with tomatoes, curry leaves and coconut milk. Diced chicken cooked with onions, tomatoes, curry leaves, coconut and fresh pepper. Mild chicken cooked with ground almonds and yoghurt, flavoured with garam masala. A spicy hot chicken curry cooked with chilli, potato and vinegar, coriander and spices. Diced lamb cooked with yoghurt, ground almond meal and cream. Lamb curry cooked with cashews, almonds and green coriander in a tomato based gravy. Lamb curry cooked with ground onions, coriander, cashew nuts and dry fruits. Lamb curry cooked with spinach, ginger, garlic finished with onions and coriander. Lamb curry cooked with mixed vegetables and spices in gravy. Diced lamb cooked with onions, tomatoes, fresh curry leaves, coconut and pepper. Diced lamb cooked with crushed pepper, onions, ginger, garlic and special house spices finished with coriander. A spicy hot lamb curry cooked with chilli, potato, vinegar, coriander and spices. Beef curry cooked with mixed vegetables and spices. A spicy hot beef curry cooked with chilli, potato, vinegar, coriander and spices. Diced beef cooked with ginger, garlic and spinach. Beef curry cooked with ginger, garlic and spinach. Diced beef cooked with crushed pepper, onions, ginger, garlic, and special house spices, finished with coriander. Diced beef cooked with onions, tomatoes, fresh curry leaves, coconut and pepper. Sheek kebab cooked in a ground almond curry with capsicums, onions and coriander. Fresh fish cooked with tomatoes, onion and coconut milk. Fish cooked with five spices, onions, tomatoes and coriander. Fiery fish curry from the western beaches of Goa. King prawns cooked with mustard seeds, ginger, garlic, lemon, onion and tomato base gravy finished with fresh coriander. Prawns cooked with sliced onions, capsicum, tomatoes, ginger, fresh chilli, coriander and spices. Prawns flavoured with mustard, curry leaves, tomatoes, onions and finished in coconut milk. Fresh king prawns cooked with almond paste capsicum, onions and coriander. Fresh garden vegetables cooked with yoghurt, spices and ground almonds. Lentil curry also available with spinach. Cooked with tomatoes ground almonds and spices finished with dairy cream. Potatoes, green peas cooked in a tomato gravy, cream, tomatoes, onions and capsicum. Diced butternut, pumpkin, eggplant steamed with onions and flavoured with white mustard. Fresh garden vegetables cooked with onion, tomatoes, curry leaves, crushed pepper and coconut. Cottage cheese, cooked with spinach, onions and spices. Homemade cottage cheese in almond meal curry with capsicum, onions, tomatoes and coriander. Saffron rice seasoned with mustard, lemon juice, green peas, tomatoes and herbs. Cucumber, onions, tomatoes, coriander, fresh lemon and salt. Wholemeal bread baked in oven. Wholemeal bread stuffed with spiced mashed potatoes. Plain flour bread stuffed with spiced mashed potatoes. Naan stuffed with spicy homemade cottage cheese. Naan with dried fruit stuffing. Naan stuffed with chicken tikka, cheese and coriander. Naan stuffed with chicken, chilli and fresh coriander. Tandoori naan stuffed with spiced beef. Warm golden brown milk balls dipped in sugar syrup. Made from reduced milk thickened with cream, cashew, almonds and pistachio nuts an Indian dessert best served cold.